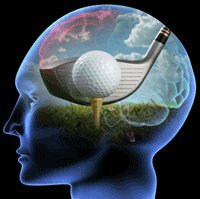 Eat Sleep Golf - Toronto: It's All in Your Head - So Think! It's All in Your Head - So Think! When you step up to the tee with a golf ball in your hand, what are you thinking? "I should have made those phone calls before I left the office" or "What was it I have to pick up at the grocery store"? If it's anything like that, you might as well turn around and go home because you're going to have a really bad day on the course. It's been said that golf is a mental game and over the years I have found that to be so true. If your mind is miles away at the office or in the grocery store, you cannot be present to that little white ball and that is the only way that you will ever become friends with it. You have to get to know it, talk to it even; but above all, you have to think about what you're going to do with it every time you address it. Years ago, when I was taking a basic golf class, we were blessed with what can only be described as a "class clown." He was a small kid so I guess he was trying to compensate in some way, but he was always cracking jokes. The instructor was one of the best I ever had in a class; he really knew his stuff and he was the only one who could keep up with the clown. One day, when the instructor was teaching us how to "address the ball," I was trying to listen but the little guy was waving his hand trying to get the instructor's attention. He wanted to go first. None of us cared much so we all stood back and watched as the boy put the ball on the tee, walked away, turned around, stopped for a moment, then walked up to the ball, looked down, and said, "Good afternoon, Mr. Ball. If you don't mind, I'm going to hit you." The instructor played along and asked him what he was doing. "I'm addressing the ball," said the boy. The class exploded with laughter and we expected the instructor to be mad but he just grinned and said, "So hit it!" He did and just barely topped it with his driver, causing the ball to pop up off the tee and land a few yards away. The boy was mortified but the instructor didn't miss a beat; he said, "Guess you'd better find something else to tell the ball - that one didn't work so well." What we learned that day was that we had to learn the right way to address the ball. And I did. I took notes, read books, watched videos, and worked on it until I could do it right by the book. So I was really upset with myself one day when every ball I hit seemed to have a mind of its own. No matter how far I wanted it to go, it fell short; no matter which way I wanted it to go, it went the other way. Finally, I threw up my hands in disgust just when the instructor was asking me, "Keith, what are you thinking?" I must have looked clueless so he said, "I'm serious, what are you thinking when you step up to the ball?" I was embarrassed to tell him that I couldn't stop thinking about that boy's joke so when I stepped up, I was thinking, "OK Mr. Ball, I'm going to hit you." But the instructor chuckled and said, "Well, that's a good start but now you need to tell the ball just how you're going to do that." He went on, "Golf is a mental game and that means that you have to put your brain in gear when you play. In other words, you have to think. You can't just step up and slam the ball any old way you feel like hitting it and expect to get low scores." This was all beginning to come together for us when he said, "Now, step up to your ball, think about what you're going to do and then tell your ball." We must have looked like dummies standing there staring at him so he grabbed a ball, set it on a tee, stepped up to it, rested his club on the ground and said, "Hello, Mr. Ball. I'm going to stand up straight, aim at that big tree, take a deep breath, and swing my club smoothly and evenly so I will hit you squarely in the middle of the club and make you take off down the fairway in a straight line for 150 yards. Then I'm going to watch the tee with my head down until you are gone." With that he, looked at the ball, looked up at the tree, looked back at the ball, and swung his club smoothly and solidly. It connected with a loud crack and the ball didn't hit the ground until it had sailed right past that tree. We cheered! In the months to come, our pro taught us a simple truth about golf. After "Think right," it is the second most crucial foundational principle to good golf. It's this: "Think straight." Of course, we all assumed he meant to think about the ball going straight down the fairway or straight towards the hole, but he reminded us that there are times when we want the ball to not go so straight, like when we're directly behind a tree or when the green slopes to the right or the fairway doglegs to the left. - Take a deep breath and close your eyes. 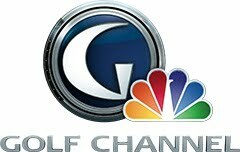 - Let any non-golfing thoughts come together into one big clump in your mind. - Picture them as a pile of useless items and mentally place them in a box. - Put the box on a shelf high above your head, which is now clear and ready to think straight. Once we got our heads on right and our thinking straight, then and only then were we ready to hit the ball. So for the next hour, we practiced our thinking. He taught us that the best way to train yourself to think something is to say it over and over to yourself until it becomes a part of you. So we spent some time arranging our "right" thoughts into short phrases that we could remember and repeat to ourselves before every shot without unduly delaying the game. Then we paired up and tried them out on each other, tweaking them until they were just right. We wrote them down and adjourned for the day with instructions to commit them to memory by the next class. When we met the next week, we were ready. Everybody had really gotten serious and we all had a "Think Right-Think Straight" list in our minds. One by one, we walked to the tee and addressed the ball out loud, repeating the words we had memorized. It felt dumb at first, but after the half dozen times he made us each do this exercise, we became more comfortable and after another half dozen times, we were pumped! We couldn't wait to actually put a ball on the tee, grab a club and make our teacher proud. We all finally knew we were "Thinking Right" and "Thinking Straight." But there was one more step in the process and that was "Thinking Through. " Reminding us that the mental process isn't over until the ball hits the ground where we tell it to go, he taught us the final step. It's called "Follow Through" in most sports, but our pro uses the term, "Think Through the Ball." In other words, he said, "keep your mind in gear as the club connects with the ball and think about it taking off from the tee and soaring straight and true to the very spot you were envisioning when you hit it. Don't just feel the 'whoosh' of your swing as it pulls the club through the ball, think it." It was a brilliant way to teach us to keep our heads down throughout the shot because picturing the ball in our minds meant we didn't need to look up until we "saw" the ball soaring through the air. Then, and only then, was it safe to look up. Without a doubt, this was the most valuable golf I ever learned - that golf is all in your mind and when you think right, straight, and through the ball, your game will show it.